As the concert ended, the atmosphere reached a climax amid applause at the riverside of Wanzhou, where two spectacular events, Concert of the World’s Great Rivers and Back to the Three Gorges, finally met in the evening of November 8 in SW China’sChongqing Municipality. They are two of the series of events of the 9th China Yangtze River Three Gorges International Tourism Festival. 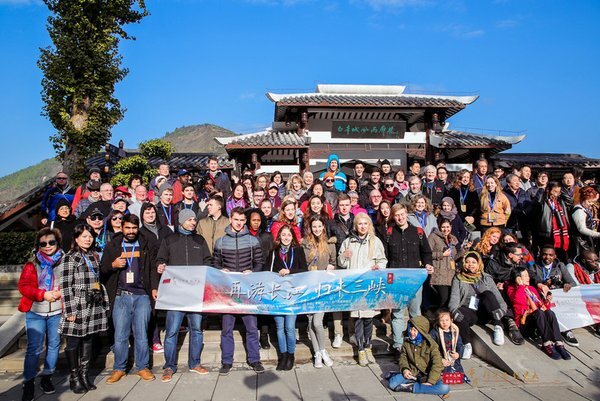 Back to the Three Gorges, an event hosted by the Chongqing Municipal Commission of Culture and Tourism Development, invited about 200 tourists from 32 countries, who visited the Three Gorges before 1997, to take a free revisit tour. These tourists boarded the five-star Yangtze Gold 6 Cruise at Chongqingand took a voyage down the Yangtze River. In addition to the classic scenic spots along the itinerary, such as Baidicheng (the White Emperor City) and the Kuimen Gate, they also visited new attractions that were developed after their previous trips. Concert of the World’s Great Rivers, hosted by Chongqing Municipal People’s Government and Hubei Provincial People’s Government, was a gala where choirs and orchestras from all over the world made a fusion. Foreign artists, including ANUNA, Mariachi Divas, the Volga Choir, Albano Carrisi, among others, as well as Chinese singers such as Dai Yuqiang and Lv Wei, performed at the concert. As components of the 9th China Yangtze River Three Gorges International Tourism Festival, the Concert of the World’s Great Rivers and Back to the Three Gorges were highlighted during the grand event, which presented a brand new Three Gorges to the world. Apart from the two grand events, a bite on the hundreds delicacies along the Three Gorges region, the 14 counties tourism features parade, and a forum with the topic of “New Three Gorges: Pleasure comes from beautiful landscape, good environment goes along with development” took place. 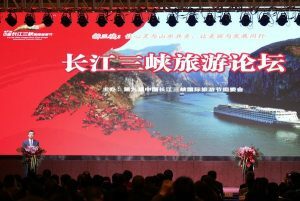 At the closing ceremony, 17 tourism projects in the Three Gorges region were signed with a planned total investment of 57.5 billion Yuan (8.4 billion USD). The Three Gorges Festival is held twice a year in Wanzhou, Chongqing, a city on the upper reach of the Yangtze River, bordering Hubei Province to the southeast. Chongqing has enjoyed rapid growth of tourism in recent years and is now more recognized than ever around the world. According to the City Travel & Tourism Impact Report 2018, released by the World Travel and Tourism Council (WTTC), Chongqing is the world’s fastest growing city in direct travel and tourism GDP in the past decade. The Three Gorges is a name card of Chongqing and China. In May 2018, Chongqing announced its plan to upgrade the tourism industry. The Three Gorges was confirmed as the first priority.